1. It appears that cereal leaf beetle has hit threshold in a few fields. Dean Volenberg noted “Seeing high densities in some fields (5 per plant) and the flag leaf is about finished off. It is hit or miss as far as scouting, one field will have them and the next is void of any larvae and adults. 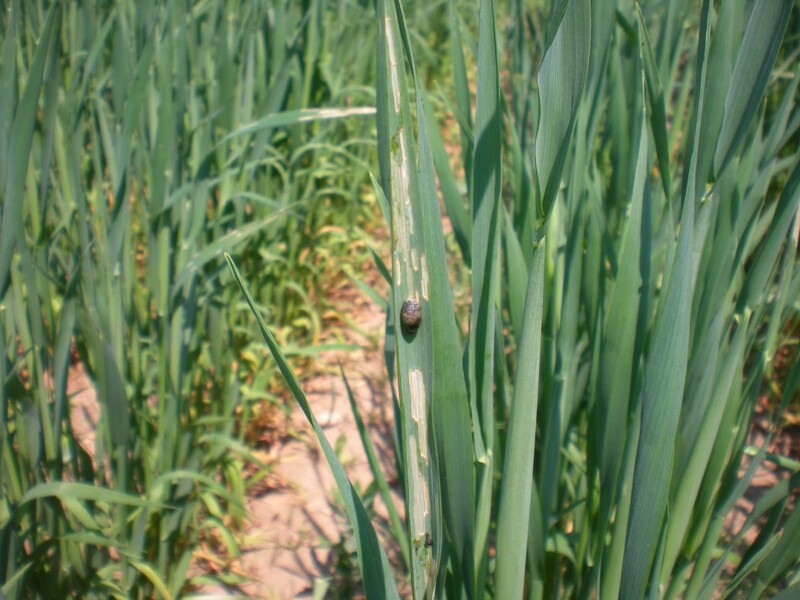 Threshold at this stage of wheat is one Cereal Leaf Beetle per plant (NDSU Extension). Image 1. Cereal leaf beetle larvae and crop injury on oat. 2. Also some late planted soybeans that were planted at the dry/wet soil threshold have imbibed water then desiccated. Please review my article entitled: Variable Germination and Emergence in Soybean: Which Seeds Are Still Viable? for recommendations. Thought I would let you know that some Nebraska soybean producers have experienced the problem of germinating seed not having enough soil moisture to complete either the germination and/or emergence process because of two reasons. One reason is because they planted in dry soil and hoped for a rain, which is risky. Some producers did get a hoped-for rain, but the rain amount was only enough to wet the soil down to where the seed was placed and not enough to connect that wet layer with the moist soil another inch or two below that seed. As a result, the seeds germinated and the radicles emerged, but because roots will not penetrate a dry soil layer, the seedlings died because rooting systems were limited to using surface water, which ultimately dried out. This scenario forced a replanting. A second reason was because some producers have been using cover crops for some years now even though I warned them that cover crop use WILL be definitively detrimental in a dry spring. We have had wet springs to date, which led producers to not think about the fact that while cover crops offer all the great stuff that extension specialists have promoted, they have ONE GIANT PROBLEM – unlike fallow which can only surface dry out in dry years, cover crops put roots into the soil and act like putting blotting paper in the soil, meaning that cover crops can transpire away the stored soil water! Well, BINGO, we got a dry spring in Nebraska this year! Cover crop users discovered the problem this year that I warned them about every time they discussed the advantages of cover crops. One NE Soybean Board Member actually found out that his cover crop had dried out the soil to a depth of almost 10 inches, and when he only got sufficient rain to wet the seed, it was definitely not enough to connect the wet soil surface by wetting the soil down to a deeper down moister soil depth. Consequently, his entire field of soybeans germinated, and then died. What’s worse for him, is that he still needed a drenching rain to eliminate that dry soil layer before he could even begin to think about replanting! Therefore, I have been re-urging all extension specialists in Nebraska to warn producers about this ever-so-often risky proposition of planting soybean seed into dry soil, or using cover crops temporally right up to the Round-Up burn-down before planting. Preventing erosion is a good thing, but transpiring off critical stored water is a definitely a BAD thing. There is no FREE LUNCH!